This article will guide you on how to set up your Linksys EA7500 Max-Stream™ AC1900 MU-MIMO Gigabit Wi-Fi Router to Bridge Mode. When your Internet Service Provider (ISP) requires it. When you want to use the router as an additional access point. When you need to disable the router functionalities to work with third party devices. When you need to solve Network Address Translation (NAT) issues. This happens when a modem router (gateway) encounters an IP address conflict with the Linksys EA7500 or experiences a strict NAT setting which is not ideal for online gaming. You have the Linksys EA7500. You have two ethernet cables: One to connect from your computer to any of the ethernet ports at the back of the Linksys router and the other to connect the modem router (gateway) to the internet port of the Linksys router. NOTE: Contact your ISP for assistance on internet connection issues when directly connected to the modem router (gateway). You have an active internet connection with your existing modem router (gateway). While the router is set to Bridge Mode, some of its features will be disabled. The router will not have the Dynamic Host Configuration Protocol (DHCP) server functionality, the built-in firewall and NAT features will be disabled. 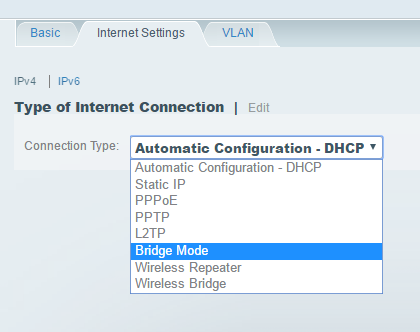 To set up the Linksys EA7500 to Bridge Mode, follow the steps below. Connect an ethernet cable from your computer to any of the ethernet ports (1-4) at the back of the Linksys EA7500. Do not connect anything to the WAN port for now. Plug the supplied power adapter to an electrical outlet and into the Linksys router. IMPORTANT: Make sure that the router’s Power light is solid before proceeding to the next step. Launch your web browser and enter the router's IP address or “myrouter.local” in the Address bar then press [Enter]. 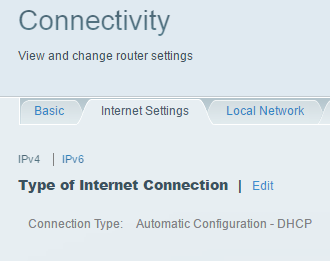 QUICK TIP: The default IP address of the Linksys router is 192.168.1.1. If you have modified it, use the new IP address instead. 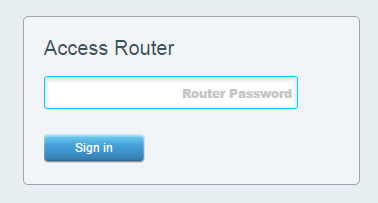 Enter the router's administrative password (default is admin) and click Sign in. QUICK TIP: If you have changed your router's admin password, enter the new password instead. In case you have forgotten your router password, click here to learn how to retrieve it. Select Internet Settings tab and click Edit. From the drop-down menu, set the Connection Type to Bridge Mode. 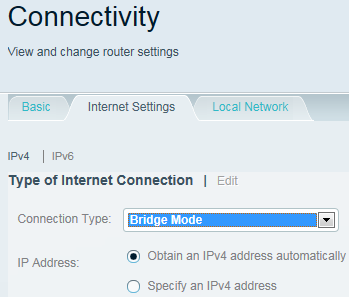 Set the IP Address configuration for your router. Obtain an IPv4 address automatically – Select this if you want the modem router (gateway) to provide the IP address for your Linksys EA7500. 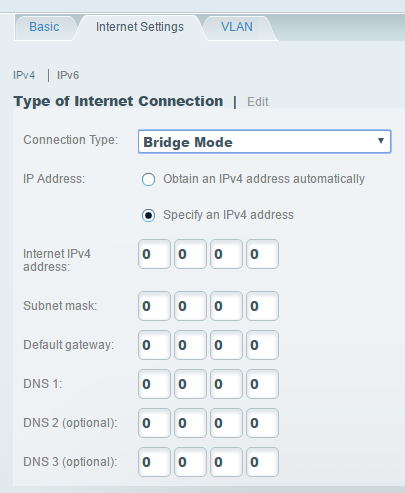 Specify an IPv4 address – Select this if you want to use a fixed IP address for your Linksys router. To do so, enter the information for your Internet IPv4 address, Subnet mask, Default gateway, and DNS entries. This information is provided by your ISP and can be found on the modem router (gateway) settings. On the Warning screen, click Yes. Your router is now set to Bridge Mode. Connect the modem router (gateway) to the internet port of the Linksys EA7500. Once your router detects that there is internet access, it will give you an Internet Restored prompt. Click Yes. IMPORTANT: If you do not have internet access after connecting the modem router (gateway) to the Linksys EA7500, powercycle the router for 30 seconds and reboot your computer. You will be redirected to the Linksys Smart Wi-Fi Sign In page. If you already created a Linksys cloud account, enter your login credentials in the Email Address and Password fields and click Sign In. 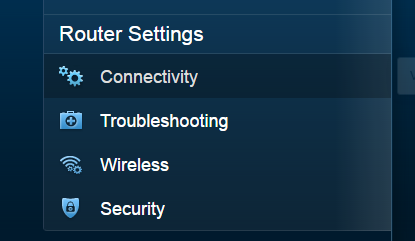 If you do not have a Linksys cloud account, click on Create Account. For instructions on how to create, activate, and associate a Linksys cloud account, click here.